Drumheller has the best badlands in Canada. Come and experience our trench and create an unforgettable experience that you can share with your friends and family. Below we’ve listed our most famous hiking trails. 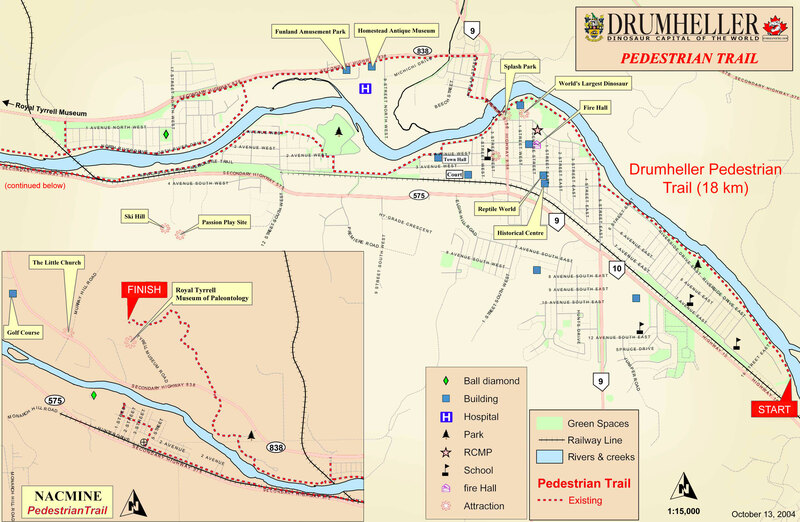 With 18 kilometres of pathways running alongside the Red Deer River, around downtown and to the doorstep of the Royal Tyrrell Museum, you can hit all the key sights by bike or on foot. Park your car at the Visitor Information Centre and walk, bike or splash your way through. The Royal Tyrrell Museum stands on the southwest corner of the 280-hectare Midland Provincial Park. A trailhead a few hundred metres east of the museum marks a one-kilometre-long loop, where interpretive signs recount the glacial forces that sculpted the badlands. The Drumheller hoodoos are internationally recognized icons of the Alberta badlands. Composed of sand and clay from the Horseshoe Canyon Formation, the solid, strong capstones protect the softer, underlying base creating their unique mushroom-like shape. Horsethief Canyon works as well today as a hiding place from humanity as it did for outlaws more than a century ago. Spend the afternoon admiring colourful layers of rock while picturing the thieves who gave the canyon its name hiding in the coulees and rebranding their stolen mares. A glacier-carved “U” surrounded by golden prairie, the aptly named Horseshoe Canyon is a dramatic introduction to the badlands. The dry, rocky valley walls can be rough on clothing and skin, but after a rare prairie rain the mud on the canyon floor is thick and slick as yogurt.